With winter in full swing, we tend to focus more on the inside of our homes rather than the outside. We spend time lighting scented candles, pulling out blankets, hanging wreaths and cranking up the heating. The days spent gardening whittle down, wooden furniture is hauled into sheds and the days of barbecues are long forgotten. Though Autumn and Winter may bring some challenges (particularly for remote period homes) these can be tackled with clever interior and exterior choices. We’ve spoken a lot about the importance of your home exterior from a tidy, practical point of view in our conduit blog, but what about when you are simply looking for a stylish visual update? A beautiful and cleverly positioned outdoor light is exactly what you need to prepare your home for the longer, darker nights. 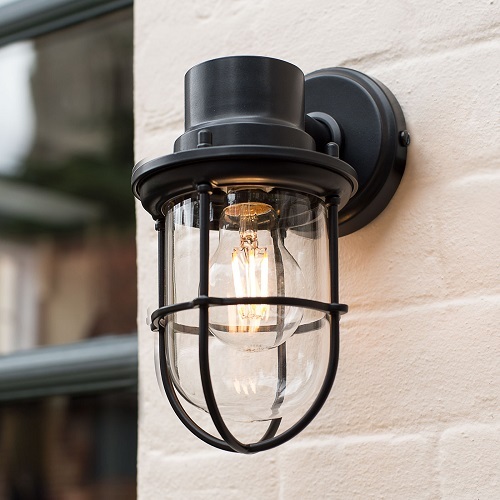 We’ve picked 5 key areas in which you can refresh your exterior with a lantern, pendant, flush or wall light to add an instant a wow factor to your property. Your porch and front door is the first thing yourself and your guests will notice when arriving, particularly if it is well lit and inviting on a dark winter night! 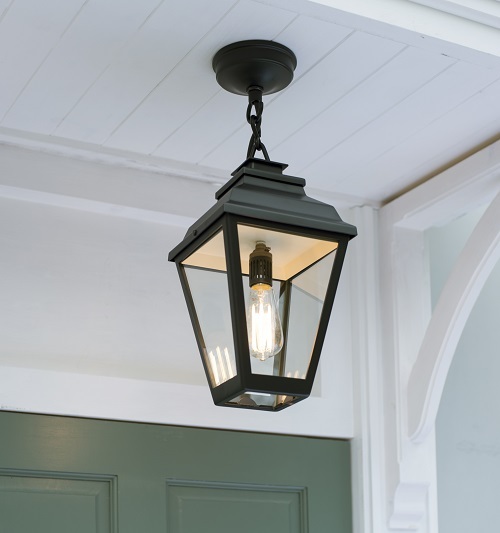 A large statement lantern like our Hackney Chain Mounted Lantern is an classic design for defining the entry to your home. 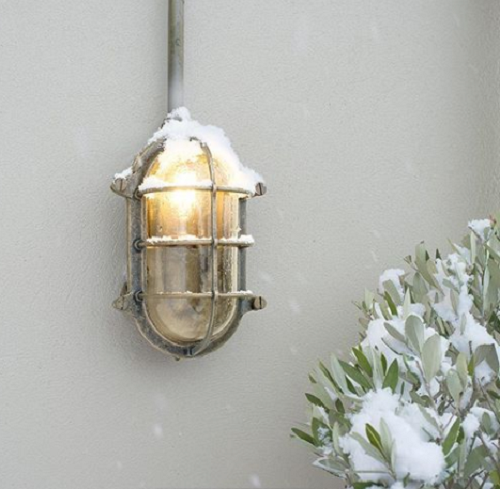 If you are looking for something a little more dainty, why not try our Holborn Outdoor Flush Fitting Light for a pretty indoor-outdoor feel? Individually hand made glass shades will bring a touch of luxury to your entrance whilst the flush is perfect for those who need to save space. 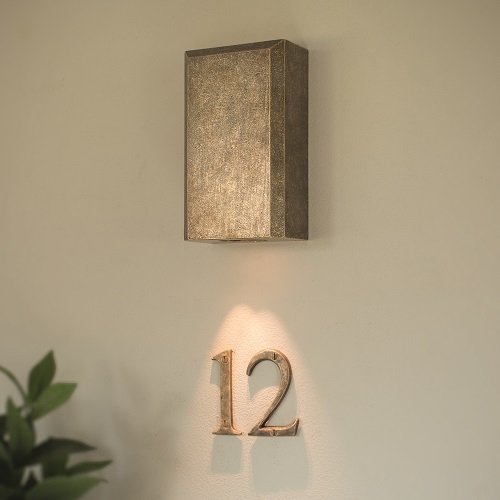 If you do not have a porch, then we suggest brightening either side of your front door with two wall lights. 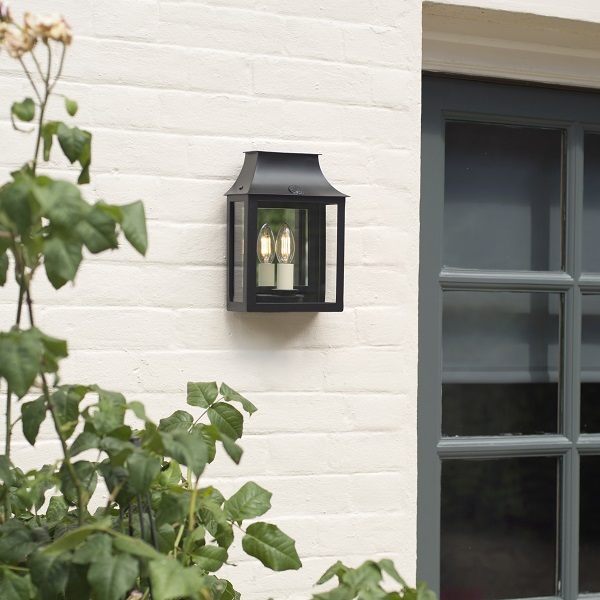 The Matt Black Finsbury Lanterns are a slick, sophisticated way to light up your home. Inviting a touch of modernity with the contemporary design but with a nod to our Great British heritage with retro vintage-look bulbs, the Finsbury is a perfect marrying of eras. 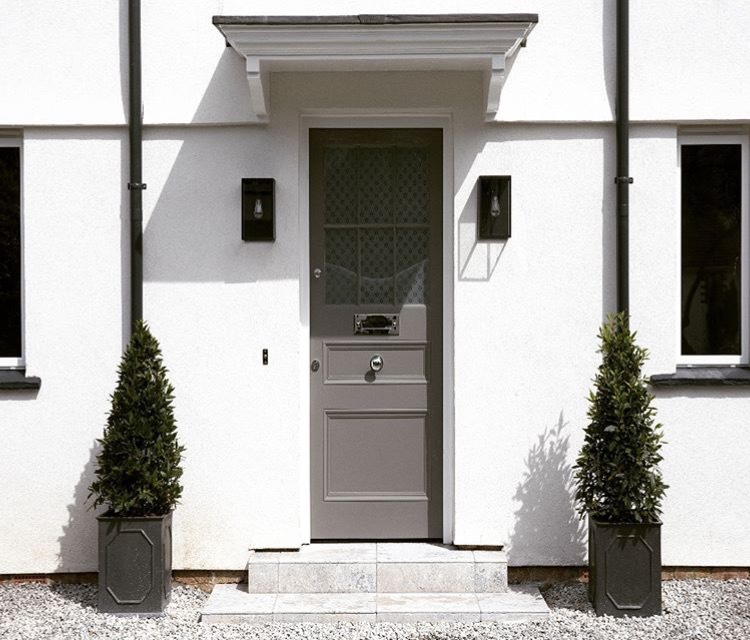 We love this 1950’s home refurb from customer Sian. In addition, downlighters are a stylish solution for darker doorways. Match the finish to your house name or number for the complete collection of picture perfect door furniture. 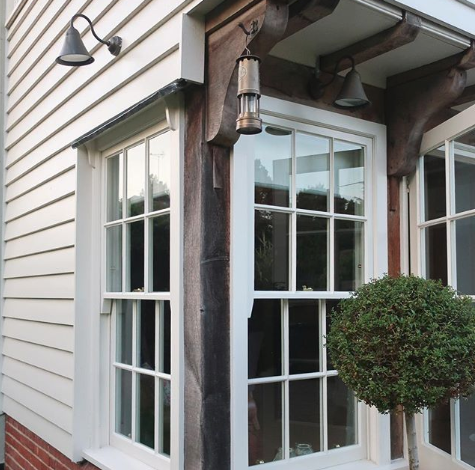 Whether you need to light up an alley way beside your home or simply want to illuminate the darker corners of your home that face the garden, we have several solutions to suit your needs. Our Corner Mounted Stable Light is a go-to choice. 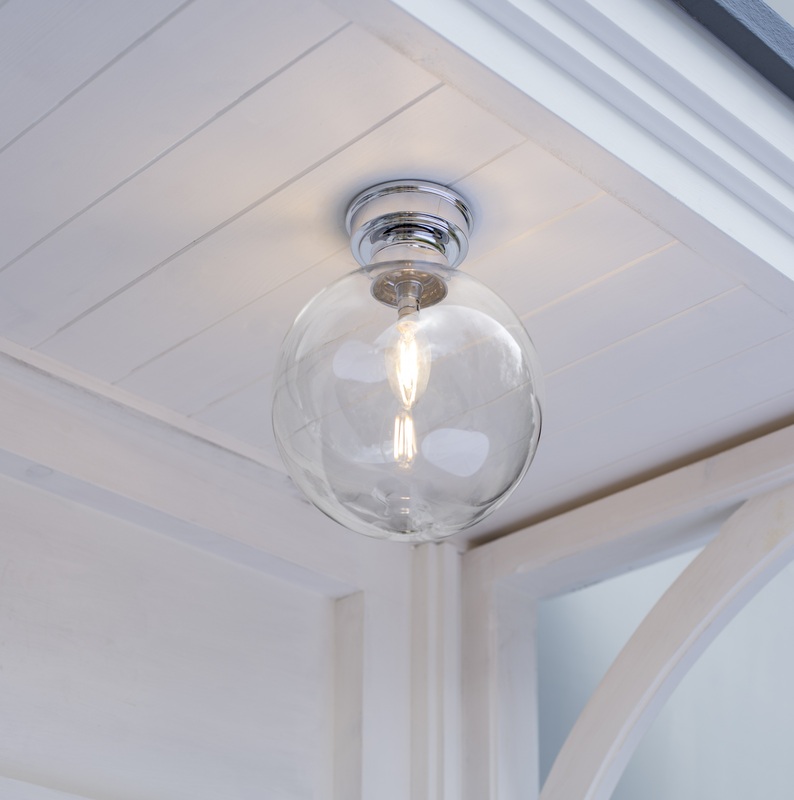 Also available with a flat mounting fitting, its beautifully simplistic design with a long neck and simple glass shade will give a rural, countryside charm to your outdoor space. The Doncaster LED Light is suited to the smallest of spaces, but with no shortage of design detail. With an overall depth of just 5.4cm it will sit neatly in even the narrowest of spaces that you need to brighten up. 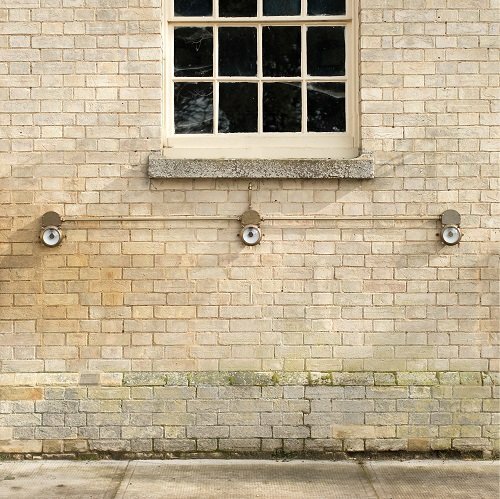 Paired with our conduit kit, the Doncaster is ideal for running along outdoor walls and passageways. We love the Peacock Lantern, and know you do too. You can’t ask for much more in an outdoor lantern. Hand made in solid brass with a decorative peacock emblem and a beautiful mirror in the back, the mirror reflects the light of the bulb when in use and the beauty of the garden when it’s not. Perfect for parties in the summer, and pretty reflecting a snow-capped garden in winter. Customer Emmy’s home style lends itself to winter, don’t you think? Whether inside or out, beautiful beams and cosy nooks need showing off. The shapely Boathouse lights are dainty enough in size but powerful enough to light up the exit your garden or patio when dusk draws in. This is where we like to get industrial. Whether a shed, garage, workshop or barn, we trust our industrial-inspired favourites will suit your needs. The Bulkhead Outdoor Light was designed with Jim’s family farm in mind. He wanted to create a stylish and practical outdoor light that would also conceal ugly exterior wires at the farm. With its robust and vintage-inspired styling, it will be sure to weather any storm. 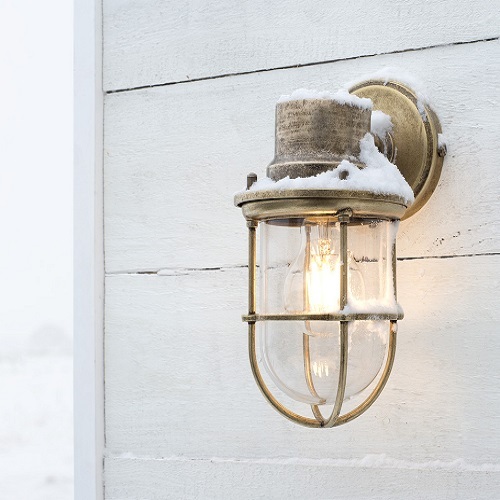 Taking influence from the nautical lighting of days gone by, the Ships light can be bought either ceiling or wall mounted in its petite size, making either style incredibly versatile for your range of outbuilding locations. To browse all of our outdoor lighting, click here. 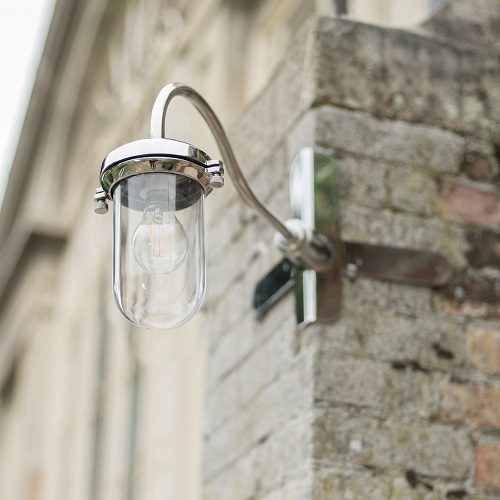 Now you’ve got the exterior lighting inspiration, take a look at our lighting guide for period properties for our indoor lighting solutions.